I know its not even Thanksgiving yet, but I've seen people posting their Christmas trees on Instagram so I'm giving myself a pass. I've been listening to Christmas music and lighting my Balsam Fir candles for a little over a week now. Sorry, I just LOVEEE this time of the year. To get a few Christmas Scrooges (I wont name any names, but I happen to be room mates with one)in the spirit I love lighting Christmas candles. I mean, who can be mad when all you smell is Christmas Tree in your house?!? Best scent ever. Anywhoo- above are some of my favorites. And a little hint to those shopping for candles, Homegoods, TJ Maxx and Marshall's are my spots for candles- they always have good ones. Time to get in the spirit people! I love Paddywax :) I have already been lighting my Yankee Candle mistletoe! I think lighting a Christmas candle is a great way to ease into the holidays. Good for you for having the spirit and passing it on. Have you tried Nest's "Holiday"? It's scent brings me back to my childhood Christmases. I'm with you! I'm a smudge early this year...trying to get a jump start on the season! remember our candle night out?? seems like yesterday! Me too! I got Sprig holiday scent from homegoods. It smells great. 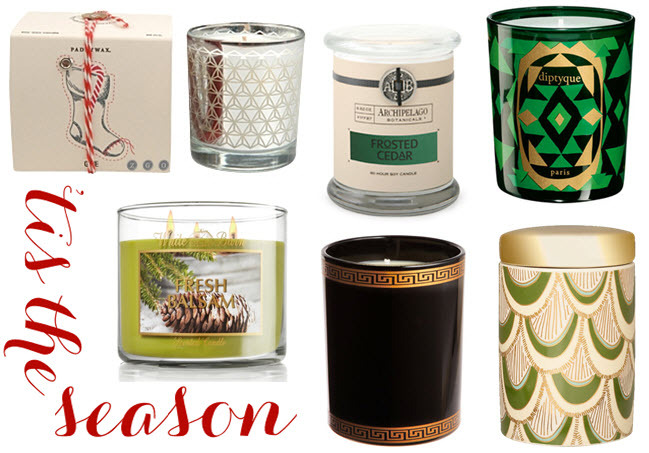 My fave though is the red Gap holiday candle! I am just now getting in the spirit! There is not much I love more than lovely scented candles! We adore candles and we make the most gorgeous Christmas Candles. I would love to invite you all to join in our Christmas Candles giveaway at The Magical Christmas Wreath Company. I'm thinking I need the Illume Gold Pine one. Pretty jar and yummy scent! The LAFCo tree candle is delicious too!